History repeats itself in the kitchen. It’s seasonal of course, whether by dint of climate or the rituals of the year. When I look up a recipe or method that I’ve used before, it’s not unusual to find the reference in the same month or so — but a year or two before. Last year around this time, I was searching for a recipe for New England style baked beans because they suited the season (and were secretly a dry run for a summer picnic). Unctuous with gently stewed bacon and sweet with molasses and maple syrup, those beans are an American classic. They were voluminous, froze well and satisfied our weekly craving for legumes. They were also a hit at the summer party. I was ready for a repeat when I came across a variation on baked beans by Martha Rose Shulman, who writes the Recipes for Health column in the New York Times. 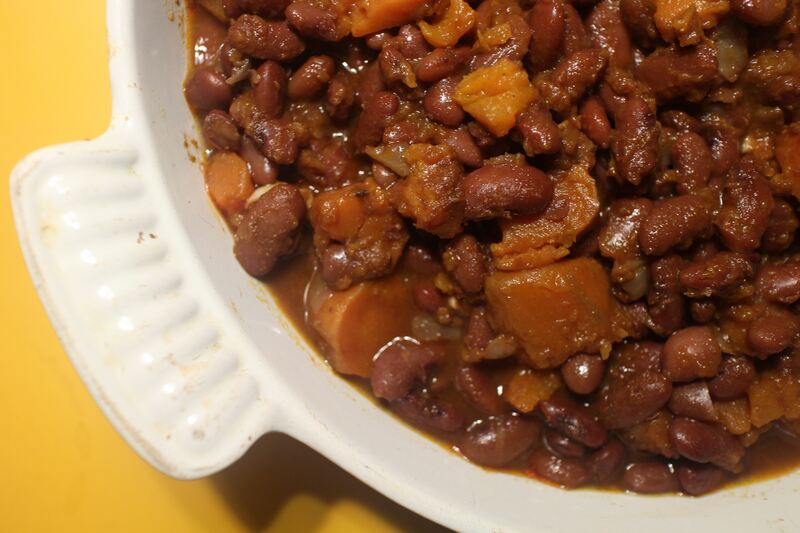 She combines beautiful red beans with bright golden sweet potatoes, and seasons them with chipotles in adobo sauce smoothed out with a mere tablespoon or so of honey and a similar amount of tomato paste. These beans cooked in less time and were incredibly flavorful. Those who crave the traditional New England variety should be equally satisfied with the more healthful version. This is now my preferred baked bean recipe during sweet potato season. Like the New England model, these baked beans improved the next day and froze well. Shulman used San Franciscano beans from Rancho Gordo. While those are sometimes available locally, I used a similarly sized and colored dark red Rancho Gordo bean called Sangre de Toro. The “bull’s blood” beans were grown as part of Rancho Gordo’s admirable partnering with Mexican farmers to propagate and preserve a diversity of heritage beans. You could also use pinto beans. 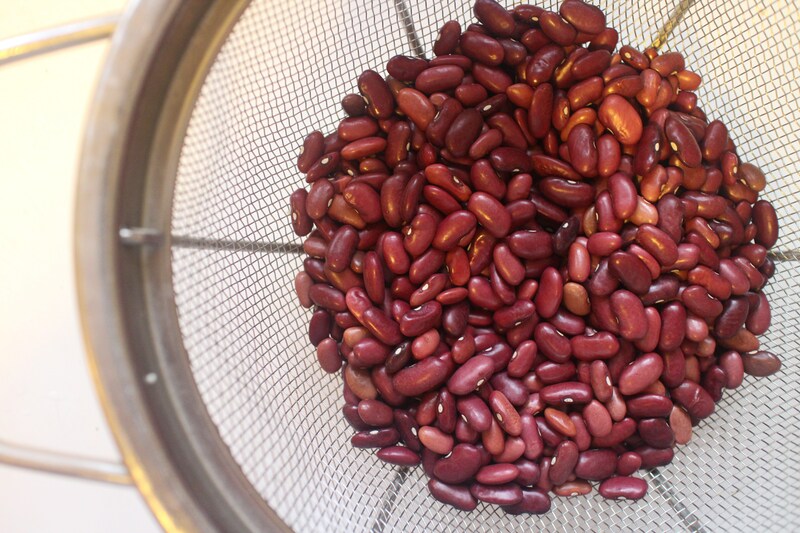 The beans need to soak for at least 4 hours or overnight before cooking, so plan accordingly. I halved Shulman’s recipe to serve 4-6. Rinse the beans and pick over to remove any small stones. Soak in 4 c of water in a Dutch oven or heavy pot for 4 hours or overnight. When ready to cook, add a bay leaf to the beans and water and heat on top of stove over medium heat. Just before the water boils, lower the heat, partially cover the pot, and simmer the beans until just tender, about 1 hour. The beans will continue to cook with other ingredients so they can be slightly on the crisp side but shouldn’t be hard. The dish could be prepared ahead to this point. Add a glug of olive oil to a small pan and sauté the onion until tender. Add garlic and stir for 30 seconds. Add the onions, garlic, chopped chipotle, tomato paste and honey to the pot of beans and stir to combine thoroughly. Add the sweet potatoes. Bake in the oven for approximately 1½ hours or until the beans are very tender and the sweet potatoes are just beginning to fall apart. Check the mixture part way through the cooking period and lower the heat to keep the liquid simmering not boiling. Add salt to taste (it probably doesn’t need any). Serve warm. The beans improve in flavor the next day and can be frozen. Makes 4-6 servings.